This isn’t the type of book I would have ordinarily picked up on my own. Kids + Cancer = Too sad for life. Generally, I don’t read books that make me unduly sad and/or cry. Life is sad enough without my favorite things making me sad, too. But this is one book I’m so glad I decided to embrace. I’ve never read John Green before. I read a handful of pages of An Abundance of Katherines, but didn’t like it much so I stopped. I’m sensing that I’ll try and read that book again, soon. Maybe I was too young for John Green before. Or not ready. Or something. I’ve just finished this book and I can’t quit crying. I’m not sure if I’m crying from sadness, from happiness, or from the beauty of the book itself. This is the pinnacle of what young adult literature should be. Beautiful, relatable, and moving. This is why I write- to teach kids that there are still things worth reading in the world and more of them are being written everyday. Kudos to John Green for sneaking in poetry and philosophy into a young adult novel. But also for writing a book so perfect in every way. There are not enough stars for this book. Maybe all the stars in the sky would be enough. But maybe not. There isn’t much else I can say without destroying the perfection of the novel, but there is this. Hazel and Augustus are just two kids with cancer trying to make sense of a messy world. Theirs is a beautiful romance, made even more beautiful by the cancer cloud that hangs over them, threatening each and every moment of their bliss. But isn’t that what all our lives are? Beautiful moments tempered with the notion that it could all end at any moment, blown away like ash in the wind. As Augustus says, “My thoughts are stars I can’t fathom into constellations”. I’ve only read one of Green’s novels, “Looking for Alaska”, and I understand what you mean about him sneaking philosophy into his Young Adult novels. 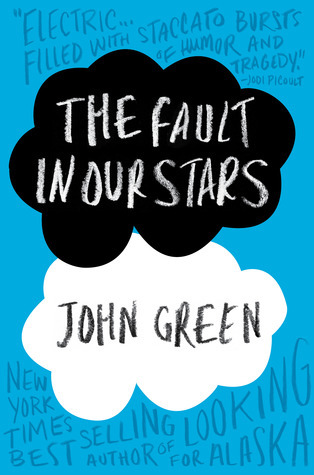 Although I wasn’t overly taken with the book, I might try ‘The Fault in Our Stars’…interesting review! I can’t, not any more. Like you say, too sad for life. I shy away from both movies and books with large emotional impact. In part it’s because I don’t bounce back as readily as I used to. Stuff stays with me. The other part is because I’m keenly aware of my position in the cycle of life. Not dreading it, but aware the choices I make for how to occupy my time are perhaps a tad more important than they used to be, if for no other reason that we don’t know how long any of us have, regardless if we are currently ill or not.